In this article, we cover mirroring. Mirroring is a technique which was actually described and used by Etteilla even before the Petit Lenormand Oracle was invented. On page 50 of his book: “Etteilla, ou la seule manière de se recréer avec les cartes, revue, corrigée et augmentée par l’auteur; sur son premier manuscrit” (Lesclapart, Libraire, Quai de Gêvres, Paris, 1773), Etteilla explains how this technique is used. The principle is actually quite easy and works rather well in string readings, as well as in a Lenormand Grand Tableau. In this example, we would read the string as we would normally: by pairing up the cards with each other, reading from left to right. The following pair would be Book (writing, publishing, studying) + Moon (fame, having the spotlight) which tells me that her publishing project (if she stays dedicated to it) will bring her fame and garner a lot of attention. Good attention, as well as recognition for a dark haired woman (my consultant). This is supported by the Lily card which is all about “recognition”. The cards are literally saying that there will be recognition for the Snake (or a dark haired woman – and she does have dark hair). In other words, if she keeps up her writing, she will be rewarded with fame and recognition. It does seem rather positive on the whole so far. So, in our example we have the Dog mirroring the Snake (in my notes I use the short form: Dog // Snake). This confirms that the Snake is a person and not a problem or argument about to arise. Next we mirror the Book and Lily (Book // Lily) which says that publishing brings recognition. It also seems to indicate that it may take a while for this success to come as the Lily is normally a slow acting card. It won’t be an overnight success, but it will be successful. Finally, we have the Moon card on it’s own, which speaks again of fame and success. Will her publishing business bring her success? I do certainly think so, especially if she sticks to it..! Step 1: You find the card that you are interested in mirroring. In our case, we’re trying to mirror the Lady (card #29). Step 2: Once you find your card, you have to recognize that it is the 3rd card from the left in the first row. However, we’re not done! Since the lady is also 3rd in the first row, it goes to say that she’s also reflected in the 3rd card in the bottom row below! So in fact, she’s also mirroring card #18, the Dog! Therefore, the Lady // Dog; Lady // Heart. In our next article on Advanced Techniques, we will cover the Petit Lenormand Grand Tableau’s House Technique in Advanced Techniques for Reading the Petit Lenormand Grand Tableau – Part 4. Stay tuned! Thanks for the amazing info. I find these posts have a lot of material. I can’t wait to get a chance to impliment all of these. Thank you very much. 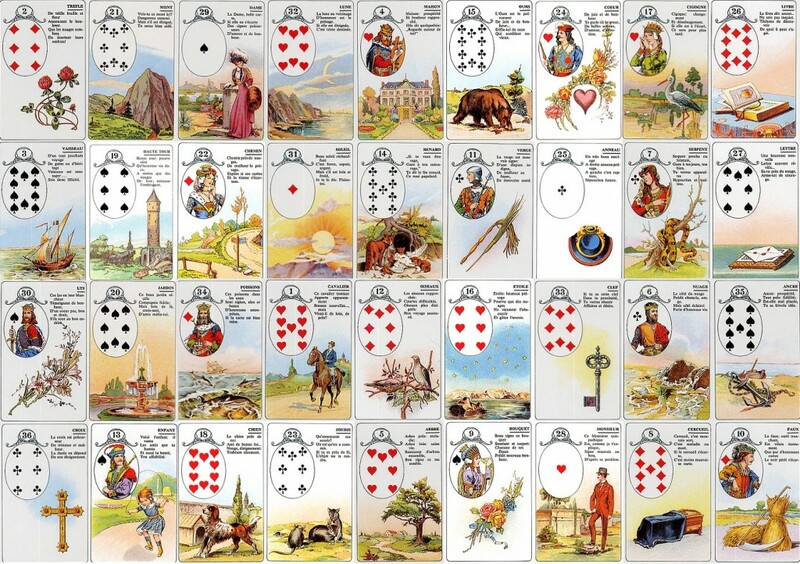 I’m glad you like our posts on how to read the Petit Jeu Lenormand’s Grand Tableau..! I’ve just posted more information on the Petit Lenormand House system..! Hopefully you’ll find it equally informative. Wonderful website! Just a question: do you find that the mirrored information has a different quality in any way from the info you get from pairs? As, for instance, diagonals expressing influences, knighting exposing hidden info. Sorry for the delay in responding. I find that mirroring is similar to pairs, giving qualities, descriptions, and small insights. For example, if the woman mirrors the snake, she has the same qualities as the snake – perhaps short, dark hair or someone who can’t be trusted. If stork mirrors horseman, it can represent a message that brings change or change caused by a young man. The Lily does indeed represent a figurehead (older man, father figured, etc), however in business contexts, it could represent your boss, etc, and that person bestowing a favor or recognizing your work. Moon would mean it is being given more public attention, whereas Lily would be more private (like a simple thumbs up), which might lead to moon like recognition. That all depends on who you’re reading for, but mirroring usually shows us how others see the person. So if a Man was mirroring they Woman, perhaps people see him as a caring and nurturing individual; if you’re reading for a man, perhaps the woman projects an aura of authority and tough love. You’d need to investigate the other cards that define the man/woman card you’re reading for.